RunnerDude's Blog: Heat, Heat, Go Away! Don't Come Back Another Day! Heat, Heat, Go Away! Don't Come Back Another Day! Most of the Central part of the country and South, and many other parts of the US have been experiencing a tremendous heatwave the past few weeks. Heat can really take it's toll on a runner, especially for runners who are in training for their upcoming fall marathons. The only saving grace is knowing that in the fall, when the temperatures drop, they'll feel faster and stronger. But what's a runner to do in the mean time? Well the first thing is good hydration. Be sure to drink throughout the day, the day before a long run. Be careful not to over hydrate and risk flushing out your electrolytes. Drinking moderate amounts of water throughout the day and eating something salty like pretzels works well or just ingesting one sports drink during the day before along with the drinking water throughout the day will help prevent depleting those vital macronutrients. If you don't want the added calories, plop in an electrolyte tablet into one of your servings of water. The morning of (about 1.5 hrs before the run), be sure to get in at least 20oz of water. Drink water throughout the run up until about 45-60 minutes. Then begin using sports drink in order to help replace vital electrolytes (mainly sodium and potassium) needed to ensure good hydration and keep muscle cramps at bay. Secondly, slow down. You will anyway, so you might as well not fight it. 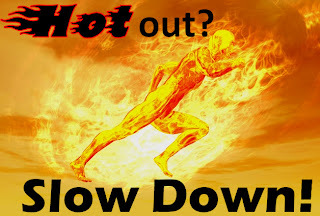 And no, you're not being a weenie when you slow down due to the heat. There's a physiological explanation. Even if you're running in mild temperatures (say around 60 degrees your core temp will begin to increase as your body "warms up." One way your body works to cool itself is to send more blood into the tiny blood vessels of the skin (the capillaries). Well, as you already know, your body has a certain amount of blood, so when it sends more blood to one area of the body, that means it decreases the amount in other areas of the body. In this case, when more blood moves to the skin, less is available in the working muscles. Less blood in the working muscles means less oxygen getting to the mitochondria in the muscle tissue where it's used in the energy-making process. Not only does that mean less oxygenated blood getting to the muscle, it means less blood available to carry away the waste products of the energy production (i.e., lactate). This combination spells fatigue and you begin to slow down. In the those milder temps, not as much blood is diverted, so you don't really see much of a difference. But as the temp climbs to the top of that thermometer, your body works harder and harder to cool itself off, and less and less blood is sent to the muscle. It's like a salmon swimming upstream. No matter how hard you try to "pick-it-up" your body just begins to peter out. When running in the heat, you need to adjust your pacing expectations, especially in a race. If your race falls on a 90degree day, a PR probably isn't going to happen. Doesn't mean you can't run, just means, you have to "keep it real." Your life is more important than that PR. Olympian and running expert, Jeff Galloway provides an Adjusting Race Pace for Heat chart. He'll be the first to tell you that this chart isn't based on scientific research, but rather his own personal experience as well as his experience coaching hundreds of runners. Heat Cramps, Heat Exhaustion and Heatstroke are three heat-related illnesses that can effect runners. Below is a description of each along with what to do for each condition (reference: Marathon.com). Good information! I'm running my 2nd half next weekend and given the temps lately I have let go the idea of PRing. Just going to give it my best and enjoy the experience. Interesting to see the Adjusting Race Pace for Heat chart. Thanks! Thank you SO SO MUCH for this post! We are having at tough time training in 90+ degrees this summer, and I have been trying to stress the importance of SLOWING DOWN to my pace group - which is very hard to do! This article explains it perfectly - I can't wait to share it with them. Especially the pace chart. I will just run around 4am or so to beat the heat. I don't even bother with it. After all, my races are in the fall. But when I do run when it is hot, I adjust my pace accordingly in similarity to the one posted here. I don't try and do it, my body does it for me. lol Take care. Thanks, Michelle, Tina and Lauren! Hey Kenley, gotta remember it for your regular runs too. Gotta get in those training runs before fall, don't ya? Run safe, my man. Run safe. 4AM. Shew...you got me beat. I'm up most days at 4:30, but not running till later. Here in NC, the humidity is so bad that it's really not that much different at 4:30AM, unfortunately.